On free trade, an issue area that has been front and center in the 2016 campaign, Trump supporters are broadly negative: They see trade agreements as having been bad for the U.S. and their own family’s finances and think the Trans-Pacific Partnership would be a bad thing for the country. Clinton supporters are on the opposite side of the issue: Most view free trade agreements positively and say they have done more to help than hurt their family’s finances. In addition, there are signs that Trump’s focus on trade has moved Republicans from a generally positive view of free trade agreements to a more negative one. Clinton supporters broadly back an increase in the federal minimum wage to $15 an hour, while a majority of Trump supporters are opposed. There also are fundamental differences between Clinton and Trump supporters in their views of the government’s role in regulating business and helping needy Americans. Donald Trump supporters are broadly critical of the impact of free trade agreements on the U.S. generally and of the potential impact of the Trans-Pacific Partnership, or TPP. By contrast, most Clinton backers have a positive impression of free trade and the TPP. Far more Trump supporters say free trade agreements have been a bad thing (68%) than good thing (26%) for the U.S. When it comes to the proposed TPP agreement, views are also broadly negative: 58% say the TPP would be bad for the U.S., compared with just 17% who say it would be good for the U.S. A quarter of Trump supporters (25%) do not express an opinion about how the TPP would affect the U.S.
By 59% to 32%, more Clinton supporters say free trade agreements have been a good thing than bad thing for the U.S. Clinton supporters also view the potential impact of the TPP positively: 55% say it would be a good thing for the U.S., while 24% say it would be a bad thing and 21% are unsure about its impact on the country or say they have not heard of it. Over the course of the last year, Republicans’ overall views on the issue of free trade have shifted in a more negative direction, while Democratic views are little changed. In the current survey, nearly twice as many Republican and Republican-leaning registered voters say free trade agreements have been a bad thing for the U.S. than say they have been a good thing (61%-32%). This reflects a sharp shift in GOP opinion from just over a year ago. In May 2015 – one month before Donald Trump announced his candidacy for the Republican presidential nomination – more Republican voters said free trade agreements had been a good thing for the U.S. (51%) than said they had been a bad thing (39%). Current Republican views on free trade agreements are more negative than they have been at any point going back to 2009, the first time Pew Research Center asked this question. By 58% to 34%, more Democratic and Democratic-leaning registered voters say free trade agreements have been a good thing than say they have been a bad thing for the U.S. 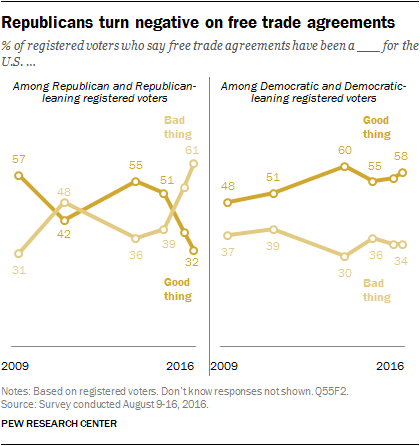 These views are little changed in recent years but are somewhat more positive than in 2009, when 48% of Democrats called free trade agreements a good thing for the U.S., compared with 37% who called them a bad thing. Differences in views of free trade extend to assessments of how these agreements have impacted voters’ personal finances. Among all registered voters, 45% say free trade agreements have definitely or probably hurt their family’s financial situation, while 40% say they have definitely or probably helped them. By a wide 68%-24% margin, far more Trump supporters say their family’s finances have been hurt than helped by free trade agreements. Clinton supporters have more positive views: 51% think free trade has definitely or probably helped their family’s financial situation, compared with 32% who think free trade agreements have definitely or probably hurt their family. Across age groups, young voters are much more likely than older voters to say their finances have been helped by free trade agreements. Among those 18-29, 66% think their finances have been helped by free trade; fewer than half of all older age cohorts say the same. Those with a postgraduate degree are more likely to say free trade agreements have helped than hurt their family’s finances by a 56%-26% margin. Views are more mixed among those with a college degree (43% helped, 40% hurt) and those with some college experience (42% helped, 45% hurt). Among those with no more than a high school diploma, far more say free trade agreements have definitely or probably hurt their family’s finances (57%) than say they have definitely or probably helped (30%). A proposal to raise the minimum wage to $15 an hour has emerged as an issue in the 2016 presidential campaign. A wide majority of Clinton supporters (82%) favor raising the federal minimum wage from $7.25 to $15 an hour; nearly as many Trump supporters (76%) are opposed to this increase. By a 54%-44% margin, more whites oppose than favor raising the minimum wage to $15 an hour. Among blacks (89%) and Hispanics (71%), large majorities favor increasing the federal minimum wage to $15 an hour. Voters with family incomes of under $30,000 a year (67%) are much more likely than those earning $30,000-$74,999 (46%) or $75,000 or more a year (48%) to support raising the federal minimum wage to $15 an hour. Overall, 51% of voters say government regulation of business usually does more harm than good, compared with somewhat fewer (44%) who say regulation is necessary to protect the public interest. Nearly eight-in-ten (79%) Trump supporters say government regulation usually does more harm than good, while just 17% say it is a necessary safeguard. Views among Clinton supporters are the reverse: 70% say government regulation of business is necessary to protect the public interest, compared with 27% who say it usually has a negative effect. Postgraduates are the most likely to say government regulation of business is necessary to protect the public interest (59%). There is less support for government regulation of business among those with less education, particularly among those with no college experience (34% see regulation as necessary to protect the public’s interest). Clinton and Trump supporters also disagree over government aid to needy Americans. By about three-to-one (72%-25%), Clinton supporters say the government should do more to help needy Americans, even if it means going deeper into debt. By roughly the same margin (71%-21%), Trump supporters take the opposite view and say that the government today can’t afford to do much more to help the needy. Most voters with family incomes of under $30,000 a year (63%) say the government should do more to help the needy, even if it means going deeper into debt. About half or more of those with family incomes of $30,000 a year or more, say the government can’t afford to do much more to help the needy.